At the event there was some buzz about the product and at one point the announcer even asked, “What the heck is that thing” so RokPak was clearly making some waves. As someone who enjoys Off-roading, I took that into consideration when designing this product. You have to think about any situation you might find yourself in and ask if the product can handle it. For example, I wouldn’t attempt one, but some Jeepers like to drive through very deep water and even across streams. What happens if you get stuck? Well the Pioneer series is designed to float and is waterproof. So as long as your things are inside they are safe from water. Anyone who knows about driving Jeeps knows that the inside of the Jeep is no safe place from water. A fan favorite is also mud pits. If you have never been off-road in a Jeep, it is important to know we like to play in the mud. Sometimes the mud wins and we get stuck. Try worrying about your phone and wallet while trying to get unstuck. 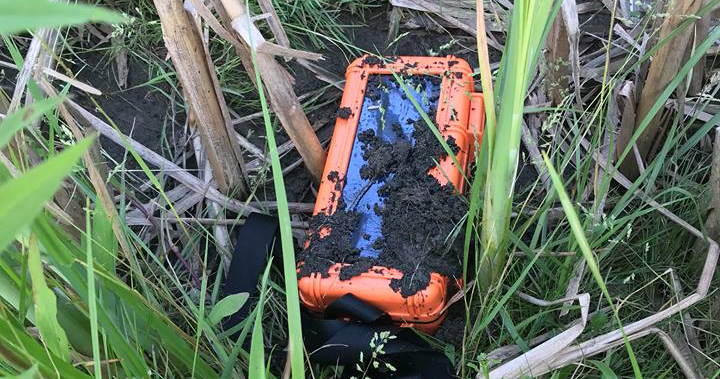 I have seen many people successfully get the Jeep out, but lose a phone, wallet or anything they might have had in their pockets. Put those things inside the RokPak and not only are they going to be charging but protected from anything. Need proof RokPak can handle it? Our friends really had some fun testing these RokPak’s. This includes dropping them in puddles to even dragging the product through the mud. No, they actually hooked up a RokPak Pioneer Series to the back of a jeep with a tether and drug it through mud and puddles. When they opened it everything inside was bone dry, safe and charging away. Last but not least these rides are a lot of fun, but there is definitely danger involved. Having a backup power source is very, very important when you find yourself far away from help or assistance. If the Jeep dies and your phone is low on battery you might not be able to contact help. The RokPak has a 12,000-mAh battery and an integrated solar panel that works as a perfect backup to the battery for those emergency situations where you need to make a call for help. Anyone who participates in Off-roading should really have a RokPak or at least some kind of backup power source. For all of our 4×4 fans we created a special promo code that drops the price so low it takes $100 OFF the MSRP. Make sure to get your RokPak today and use PROMO CODE: 4X4to get the discount plus free shipping. ***Don’t forget to add your short charging cable too, so you can recharge your phone inside the RokPak without the extra 2.5’ of charging cable taking up all the storage space inside.